Prosthetic Head is an automated, animated and reasonably informed artificial head that speaks to the person who interrogates it. 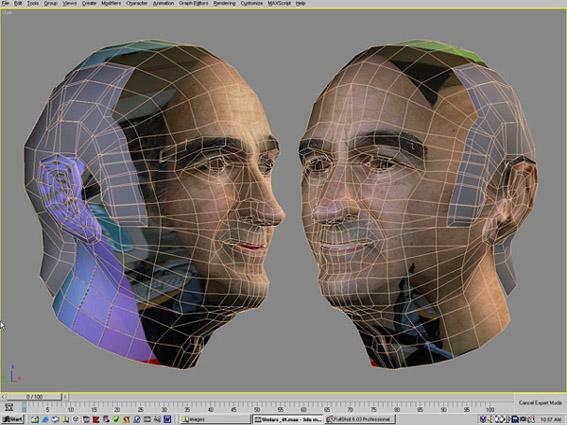 The PROSTHETIC HEAD project is a 3D avatar head, somewhat resembling the artist, that has real time lip-synching, speech synthesis and facial expressions. Head nods, head tilts and head turns as well as changing eye gaze contribute to the personality of the agent and the non-verbal cues it can provide. It is a conversational system which can be said to be only as intelligent as the person who is interrogating it. It has embedded algorithms that enable it to generate novel poetry and singing each time it is asked. Embodied Conversational Agents (ECAs) are about communicative behavior. It has an ultra-sound sensor system that alerts it of the user’s presence, enabling it to initiate a conversation. With a vision system, The PROSTHETIC HEAD will also be able to detect the color of the user’s clothing and be able to analyze the user’s behaviour. This information would then be used by the PROSTHETIC HEAD to make its conversation more interactive and convincing. In the near future you may rest your head on your loved ones chest. He is breathing and warm to the touch. He is alive. But he has no heartbeat. This is not an illustration of a disembodied intelligence. Rather, notions of awareness, identity, agency and embodiment become problematic. Just as a physical body has been exposed as inadequate, empty and involuntary, so simultaneously the ECA becomes seductive with its uncanny simulation of real-time recognition and response. Initially decisions would have to be made about its database and whether The PROSTHETIC HEAD is a pathological, philosophical or simply a flirting head. A problem would arise though when the PROSTHETIC HEAD increases its database, becoming more autonomous in its responses. The artist would then no longer be able to take full responsibility for what his head says. Stelarc is an Australian performance artist who explores alternate anatomical architectures. He has performed with a THIRD HAND, a VIRTUAL ARM, an EXTENDED ARM, STOMACH SCULPTURE and EXOSKELETON, a 6-legged robot. FRACTAL FLESH remotely actuates the body with electrical stimulation. PING BODY and PARASITE explore the body choreographed by internet data streams. PROSTHETIC HEAD, ARTICULATED HEAD, FLOATING HEAD and SWARMING HEADS are alternate embodiments of conversational agents. EAR ON ARM is partly surgically constructed and partly cell-grown. It will be internet-enabled, accessible to people in other places. In 1997 he was appointed as Honorary Professor of Art and Robotics at Carnegie Mellon University, Pittsburgh. In 2000 he was awarded an Honorary Doctor of Laws by Monash University, Melbourne. Between 2006-2011 he was a Senior Research Fellow at the MARCS Labs at the University of Western Sydney. In 2010 he received a Special Projects Grant from the Australia Council and was also awarded the Ars Electronica Hybrid Arts Prize. He is presently Chair in Performance Art, Brunel University West London. Stelarc’s artwork is represented by SCOTT LIVESEY GALLERIES, Melbourne.